Easycooking: Chocolate Mud Cake ~ For Suma & Blogger Meet[s] !! 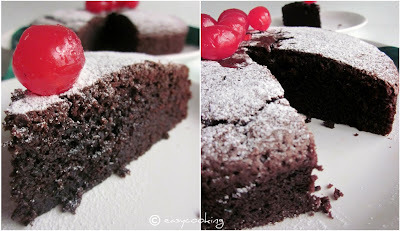 Chocolate Mud Cake ~ For Suma & Blogger Meet[s] !! They say excuses are a waste of time,your friends don't need them and your enemies won't believe them.I definitely consider Suma as a dear bloggie pal and I hope she doesn't mind this long over due post. It was a while back[more than 2-3 months I guess] that Suma e-mailed me and requested me to do a guest post on her blog.She even kept the window open asking me to post anything which fancies me,though I couldn't ignore the *hint* on Cake.Now come on,for some one whose blog is named Cakes and More,what else can you bake?? Many things kept me from posting this on time.But I wouldn't get into all that,better late than never.I wanted the Cake to be Chocolatey and believe me,this one's full of it.Fudgy and gooey,this one could almost pose as a Brownie and you wouldn't know the difference! !Perfect with a scoop of Chocolate Ice-cream with some Chocolate sauce on top with some toasted nuts.And the colour..ah the colour.Oh,I could grab that plate and go into Chocolate Nirvana.Suma,here it is for you and I hope with this one I've made up for being such a Late Lateef!! I almost felt guilty eating this on my own when I actually made it for you!! Hop on to Suma's blog for the recipe and more! It is fun meeting people who share the same enthusiasm[some even more] as you when it comes to clicking pictures of food rather than people,who don't feel offended when you ask a recipe before asking pleasantries and those who don't mind by being known by their blog names rather than their own.Yes,I am talking about meeting fellow food-bloggers.I first met few of them personally back in June when we had an out of the moment mini-bloggers meet at a restaurant.But this time Oh boy,it was nothing close to mini and as named by us,it was a Mega blogger meet with a whooping 16 of us turning up. Some of us were meeting each other for the first time but it didn't feel like so.We were giggling and clicking pictures and eating from each others plates at the same time,much to the chagrin of the floor manager who asked us to leave!! !Yeah,Veena,even threatened to sack him and hence was proclaimed the official security of Chennai Food Bloggers.And then the person whom we thrust our cameras and asked to take group photos.He looked a bit iffy in the beginning but a few snaps later,he joined in the fun!! All in all,an afternoon well spent.I am definitely looking forward to such meets in the future,we do have a few things planned in our heads regarding this,hope it materializes!! Few of us met again on Monday since Bharathy was in town and wanted to meet us all.It was organized in a jiffy and we met for a casual lunch at Mathsya,a restaurant in T-Nagar.It really does feel nice when you spend time with someone whom you've known only through their blogs or facebook profiles.I am looking forward to more such meets in the future!! Well penned and ya had a nice time with everyone. Hope to have some meetings in future too. 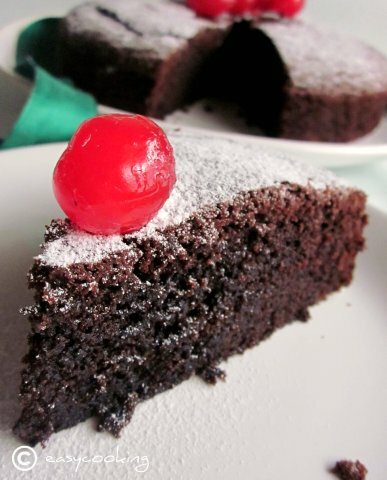 The cake looks so chocolaty with lovely texture, Divya. Like the cherry on it. It was fun meeting and spending time together. Hey the cake looks yumm ! 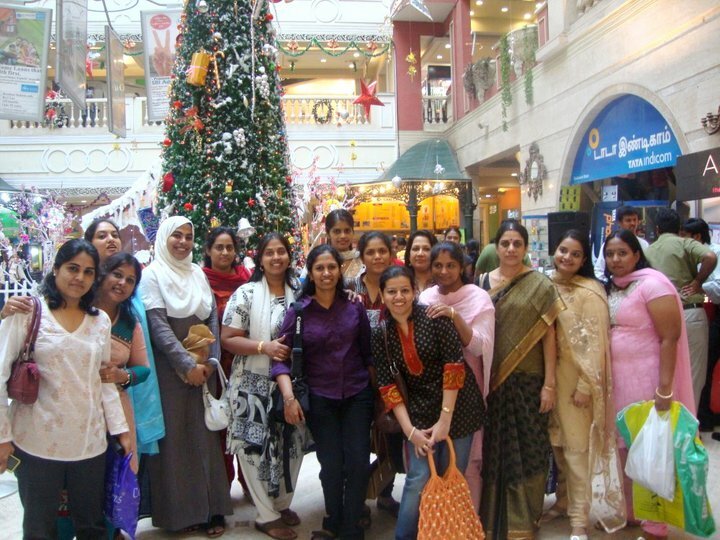 and it looks u had some of the best times in the bloggers meet ! I dream a lot about bloggers meet and just waiting to meet u all while my next trip to India, btw mud cake looks absolutely gorgeous Divya..just saw at suma's space.. Very gorgeous looking cake. Click is good and any chance of knowing who is who ??? Looks like u had a gala time. Thats a great get together i must say...love this cake. Delicious looking cake...looks like u guys had lots of fun!! looks delicious and I am sure you all must have a lot of fun during the meet. Next time you bloggers meet in BR mathsya get a discount too.Just contact Mr.Vijaykumar Admin Manager and mention your name and blog. Such a gorgeous one Divya!! I want to tell you my sister has become the Garlic roll champ!! :D .. I still have to try my luck..but I loved them, they are yum!